The pericardium is a double-walled sac that surrounds the heart; it contains a small quantity of serous fluid to prevent friction with its constant movements. 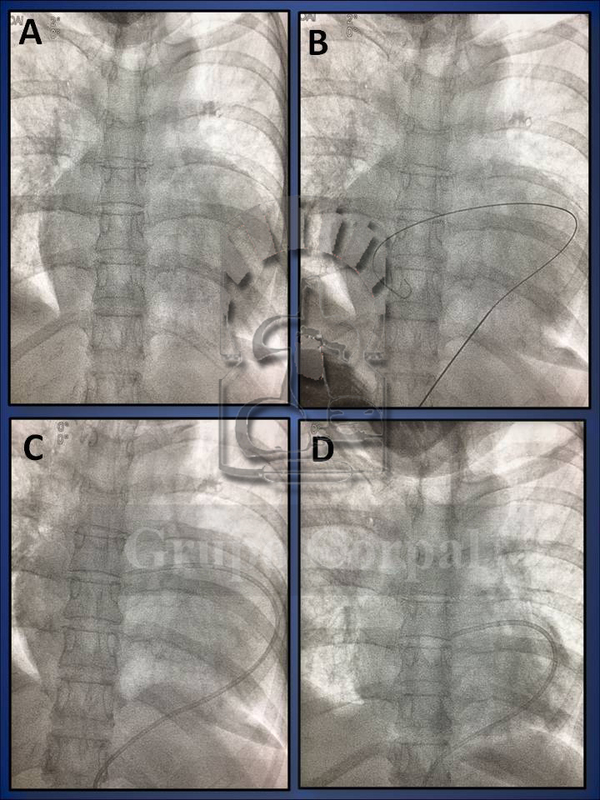 The content of the double serous wall or pericardial cavity is therefore practically virtual. However, occasionally, either due to irritation, infection, viruses, tumour processes, or even perforation of a cavity, the pericardial content can increase considerably, thus hindering the movements of the heart, particularly ventricular filling. When the collection is extreme, the heart can present difficulty pumping, surrounded by pericardial fluid that can lead to what is known as “Pericardial Taponade”, which can be fatal. This is a medical emergency and is treated by Pericardiocentesis. The patient is transferred to the haemodynamic room and, flat on his or her back, after filtering local anaesthetic into the sub-xiphoid area, a long needle is inserted with radioscopic control towards the left shoulder. Radioscopy enables precision and by touch we detect when the outer layer of the pericardium is crossed and the needle enters the pericardial sac. A guide is then inserted in the pericardial cavity, with a dilator, through which a catheter is inserted, connected to a bag. If the taponade is massive, it is initially aspirated with a syringe to haemodynamic recovery and then it is connected to the drainage bag. A biological analysis of the fluid is performed to study the cause and establish treatment. After a pericardiocentesis, the evolution of the pericardium has to be monitored by echocardiogram. If it ceases to drain after 48 hours, the drain is removed and the study continues. Pericardiocentesis can prevent taponade and occasionally saves lives.